Staffordshire Young Farmer Peter James made history at this year’s NFYFC Farm Skills competition weekend – by becoming the first member to win Senior Stockman of the Year two years running. 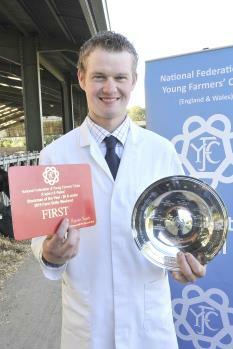 “People have won it more than once but there are no names consecutively on the trophy,” said the Leek YFC member. Peter (pictured right) beat off competition from 16 other finalists at the event held at Harper Adams on 5 and 6 September. But he had no idea that he would be able to successfully defend his title. Competitors had to submit a written project on herd management ahead of the weekend when they were tested on their knowledge. They were also interviewed by a vet on their knowledge of combatting problems in animals before judging livestock in beef, breeding sheep, dairy and pig categories. 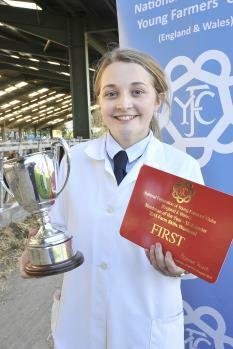 In the Junior Stockman of the Year category, Herefordshire FYFC member Megan Watkins picked up first place. Megan (pictured right) has competed in several stockjudging competitions and recently came second in the national dairy stockjudging finals at this year’s Great Yorkshire Show. As well as judging four rings of stock, competitors had to complete a veterinary questionnaire and identify cuts of meat. Megan, from Craswall YFC, came out top with 509 out of a possible 600 marks. In the team categories at the Farm Skills Weekend, Pembrokeshire FYFC won the Efficiency with Safety competition and Devon FYFC won the Fence Erecting. Pembrokeshire’s Llyfyfran YFC has a strong tradition in the Efficiency with Safety competition and this is the second time that the team of Caryl Bevan, her brother Rhys, Berwyn Warlaw, and Alistair Lawren has won the National final in three years. Thanks to support from Massey Ferguson, Kuhn Farm Machinery and Honda, teams had to deal with a practical first aid task in a staged farm accident as well as practical tasks on a tractor, plough, hedgecutter and quad bike. 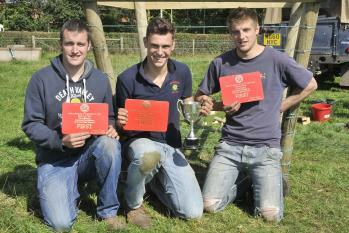 It was the first year the Devon team (pictured right) had entered the Fence Erecting competition but Jordan Ford made a winning team with his cousin David Ford and friend Richard Burrows, all from Witheridge YFC. “To be honest, we haven’t really had time to practice but David and I work for my dad’s fence contracting company and Richard is a carpenter, so those skills have helped a bit. “Everyone at the club was really proud – this is the first time that they have won it.